Imagine going home where your family is all set for another binge-watching night. You have agreed what food to order. The playlist is ready. Your pillows are waiting to be cuddled during those heart-stopping scenes. While this seems exciting, you should know by now that a sub-standard entertainment system simply will not do. Get the ultimate home entertainment package by taking home your very own Samsung Soundbar through their Nationwide Promo until September 17. You have a few days left to complement what you see on screen with outstanding audio quality while saving big time. 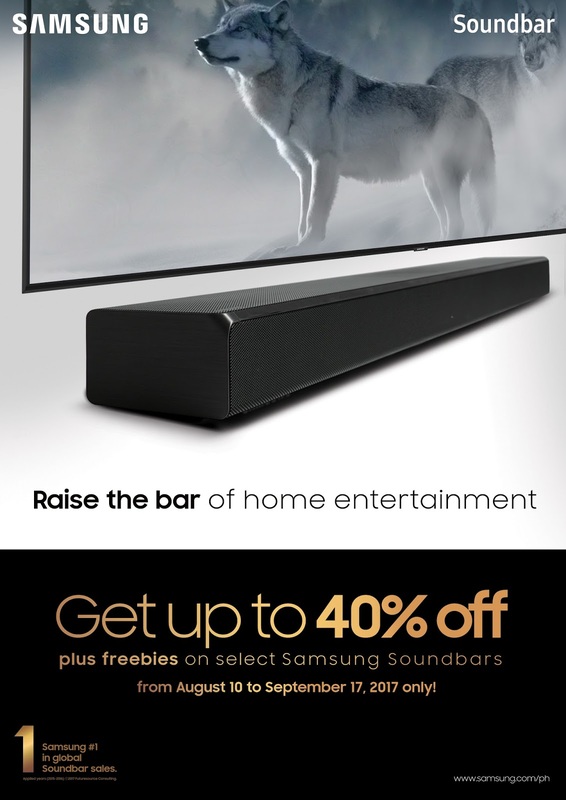 Samsung is offering discounts of as much as 40% on its premium-grade soundbars to bring cinema perfection closer to your home. On top of the huge markdowns, Samsung's Soundbar with Dolby ATMOS (HW-K950) comes with free items such as the Wireless Audio 360 speaker and a Blu-Ray player. Meanwhile, get free wireless rear speakers when you purchase select soundbar models HW-MS751, HW-MS650, HW-M4501, and HW-M550. Being number 1 in global sales year on year, Samsung Soundbars promise to raise the bar of your home entertainment as you watch your favorite films, stream music, or play a video game. Its multiple built-in speakers, each with dedicated amplifiers, are crafted to make stunningly realistic multi-dimensional audio achieving theater quality in the comfort of your own home. It also delivers the right level of bass so that whatever you hear through the soundbar is exactly how the artists and filmmakers intended it to be. Lastly, with the consumers in mind, the Samsung soundbars champion wireless connectivity to freely connect your TV and smartphone conveniently via Wi-Fi and Bluetooth. Grab your chance to experience sound like never before! Get to know more on how to raise the bar of your home entertainment system by checking out the lineup of high-quality Samsung soundbars when you visit the Samsung Facebook page or samsung.com/ph/offers/.